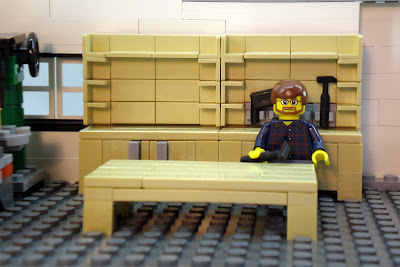 Brick Town Talk: Wood Working Shop With Tools - LEGO Town, Architecture, Building Tips, Inspiration Ideas, and more! The dude looks like the 'This Old House Classics' guy, Norm. Wow, I went back to the site and read that the guy was actually going for the Norm look. I think lego bricks can be assembled and connected in many ways, to construct such objects as vehicles, buildings, and even working robots. Anything constructed can then be taken apart again, and the pieces used to make other objects.